Dr. Jekyll and Mr. Hyde, adapted by Jeffrey Hatcher, is based on the original novella “Strange Case of Dr. Jekyll and Mr. Hyde” by Robert Louis Stevenson. Both the play and the original work explore the fine lines between good and evil and what those characteristics can do to a man. 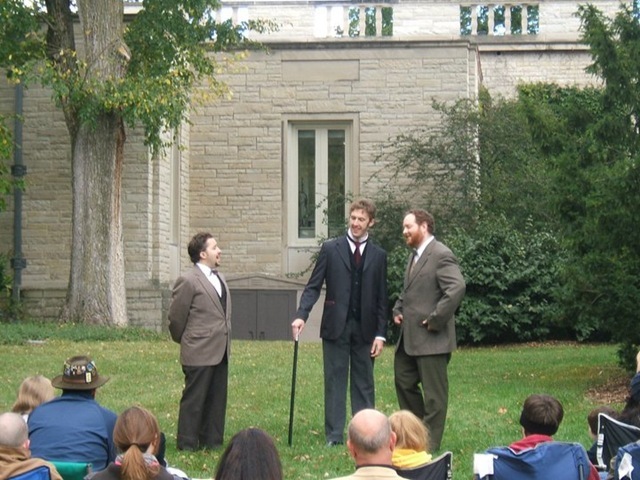 The Morton Arboretum sets the scene for the Theatre-Hikes production of Dr. Jekyll and Mr. Hyde. The vast outdoor space leaves plenty of room for the actor’s personalities to shine through. 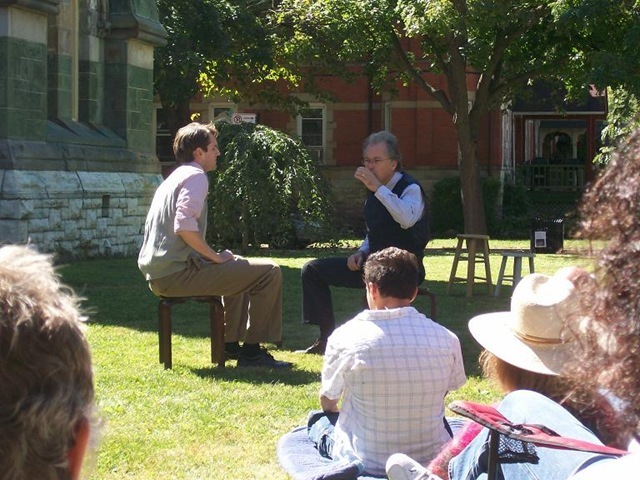 With the leaves of the trees changing and the wind rustling through the fallen leaves, there is a unique and apt ambience that surrounds both the actors and the audience. Although it was a little chilly, once the action began it no longer seemed to matter. Jekyll/Hyde opens on the main characters finding Dr. Jekyll unconscious which leads to flash backs exposing the chain of events leading to Jekyll’s current state. The story unfolds through journal entries, police reports, notes and other writings from the main characters. 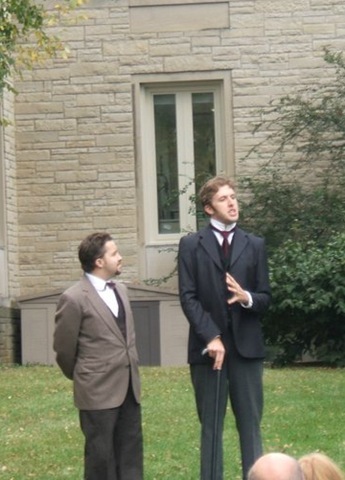 To begin, two of Jekyll’s friends, Richard Enfield (Zach Bloomfield) and Gabriel Utterson (James Stanton) discuss a peculiar occurrence witnessed and how the man involved is related to Jekyll. The play opens rather strongly, setting a good tone for the rest of the performance. Energy levels are high and stay high throughout the two-hour run of the show. It’s also clear that the actor’s work with their dialect coach, Allison Reinke, has paid off because their accents effortlessly transport the audience back to London in 1883. The two men meet with Dr. Jekyll (Dan Toot) and discuss the event only to find out the man involved; Mr. Hyde (played at various times by James Stanton, Zach Bloomfield, Geoff Crump and Ellenkate Finley) is an acquaintance of Jekyll. Toot offers up a calm demeanor with Dr. Jekyll and creates an authentic presence on stage. He gives off a confident and intellectual air, as one expects from a doctor. The character of Mr. Hyde, although played by aforementioned actors throughout the course of the play, is mainly played by Geoff Crump. Crump also does the best job of portraying the terrifying and menacing Mr. Hyde. It’s never quite clear why four actors have been cast to play this one character, for although the others did a fine job, in the end they pull focus from Crump, who proves to be the most devilish and mysterious of them all. Continuing on, the play continues to tell the parallel stories of Jekyll and Hyde. Mr. Hyde meets a woman, Elizabeth Jelkes, (Amanda Presz) and they fall in love. Despite all the bad he has done and that he inherently is, she loves him. However, their first meeting is a frightful one when Hyde pulls a knife on her. Unfortunately, the feelings of fear and raw emotion could have be taken further in the beginning – it doesn’t feel like a genuine fear or evil. That being said, as the show progresses, Presz and Crump get in synch with their characters, creating a much more realistic portraits; pulling the audience into the action. As we learn more about the dichotomies between Jekyll and Hyde, it becomes increasingly captivating. All the actors do a terrific job of keeping the audience in the moment. 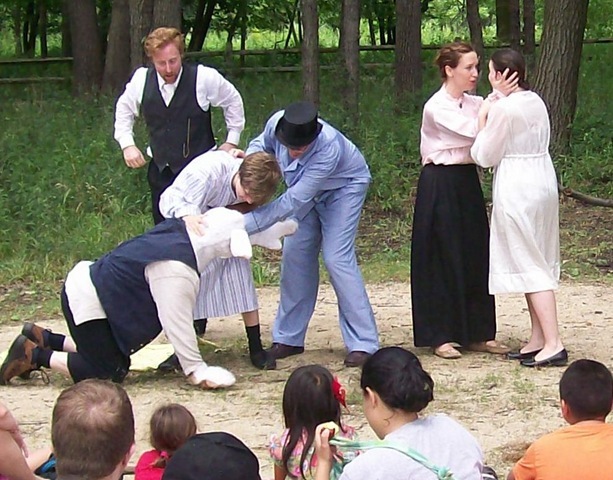 Thus, when a scene ends and the audience must move to the next scene location (the hike part of Theatre-Hikes), there’s a moment a surprise at being taken out of the action on stage. Once settled, the actors are able to jump right back in and immediately the audience is, once again, lost in this fantasy world. Bloomfield, who plays several parts throughout (Sir Danvers Carew, Richard Enfield, O.F. Sanderson, Inspector, Hyde 2) does a wonderful job of switching between them. The characters come off different and unique, which is important. As Jekyll, Enfield, Utterson Toot, Bloomfield and Stanton have good stage chemistry, and it’s definitely believable that they are old friends or colleagues. As Dr. Jekyll and Mr. Hyde concludes with its final scenes, Crump as Hyde (3) really comes into his element. He pushes his character to its limits, creating depth and a large character arch, making for an overall enjoyable production. What better way is there to see a top-notch performance AND get a workout all at the same time?!! 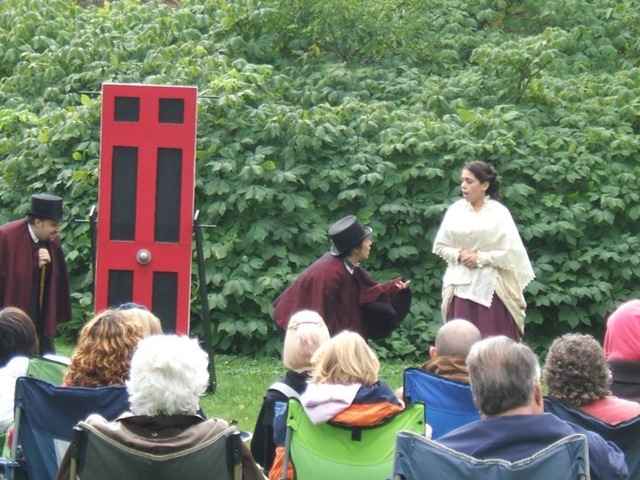 Dr. Jekyll and Mr. Hyde plays at the Morton Arboretum through October 31. Tickets are $13 to $19 and can be purchased through the Theatre-Hikes website. 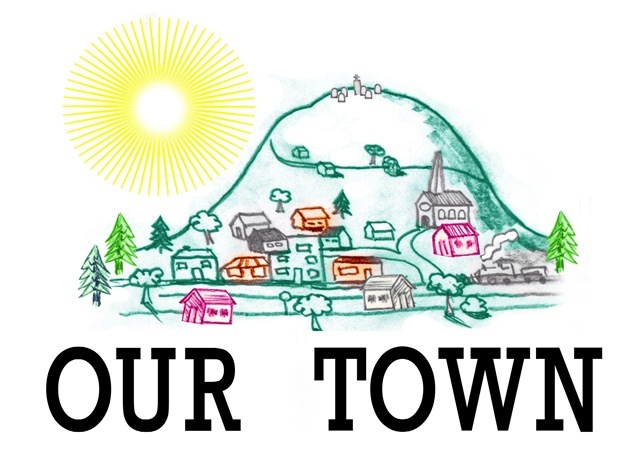 Our Town, written by Thornton Wilder, offers a glimpse into the daily lives of average Americans in small town New Hampshire. Set from 1901 to 1913, this play takes the audience on a journey of growth and discovery. Focused mainly on the characters of George Gibbs and Emily Webb, Our Town depicts life typical of how things were at the beginning of the twentieth century. 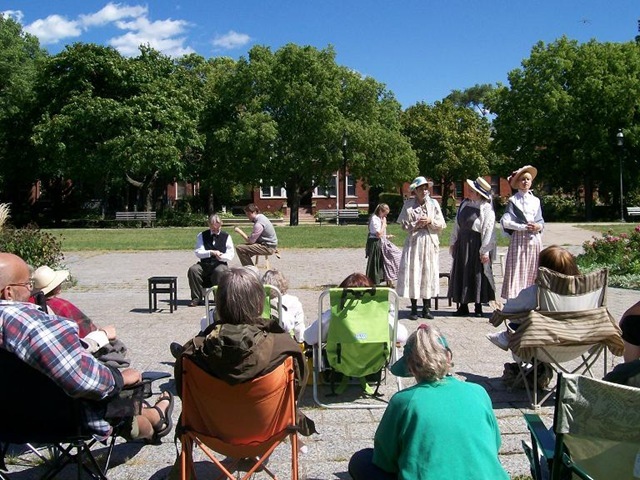 The Pullman Historic Museum provides the backdrop for Theatre-Hikes’ Our Town, creating a feeling of being transported back to the early 1900s. 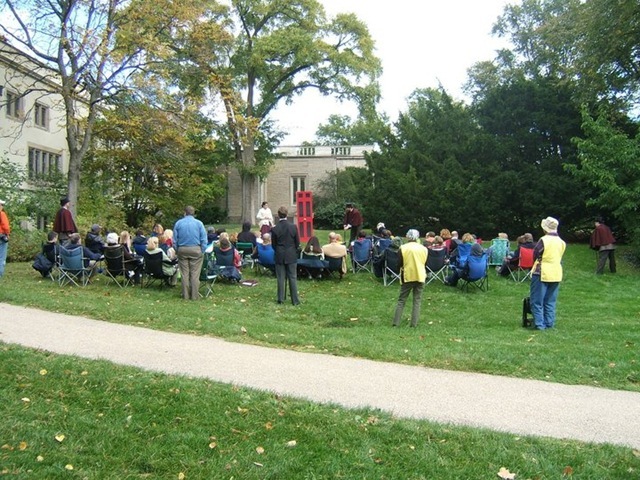 (Note: future performances will occur at the Morton Arboretum). Grover’s Corners, NH, the location of Our Town, is brought to life through this use of this space. Being outdoors however, the cast had to compete with airplanes overhead, car alarms and some rather jubilant church music wafting through the air. The cast succeeds, however, in distracting the audience from such deterrents with their strong, captivating performances. Each scene has very minimal set pieces – only six stools. The rest of the action and props are pantomimed. The cast does a good job acting out different experiences without the use of physical props, allowing for the story to really shine through. Our Town opens on a typical day in Grover’s Corners with the actions narrated by the stage manager (Dan Scurek). Our Town is a meta-theatrical play that announces it’s a play, breaking through the fourth wall to directly address the audience. Scurek’s stage manager/narrator jumps right into character from his first line. He’s incredibly personable and animated with both his words and his actions, creating a character that one looks forward to hearing from. The narrator introduces the rest of the characters in act one, “the Daily Life,” including Mrs. Gibbs (Mary Nigohosian) and Mrs. Webb (Jeanne Scurek). Nigohosian clearly fleshed out her character with a relatable demeanor. She is entertaining to watch as she neatly gets her family ready for the morning – making breakfast and attending to her husband and children. She proves to be the stronger of the two women, set against J. Scurek. Mrs. Webb is, of course, a proper woman, but Scurek plays her a bit too stiffly. She overacts at times, causing the character to feel forced. The audience is also introduced to young George Gibbs (BJ Engelhardt) and Emily Webb (Courtney Payne). 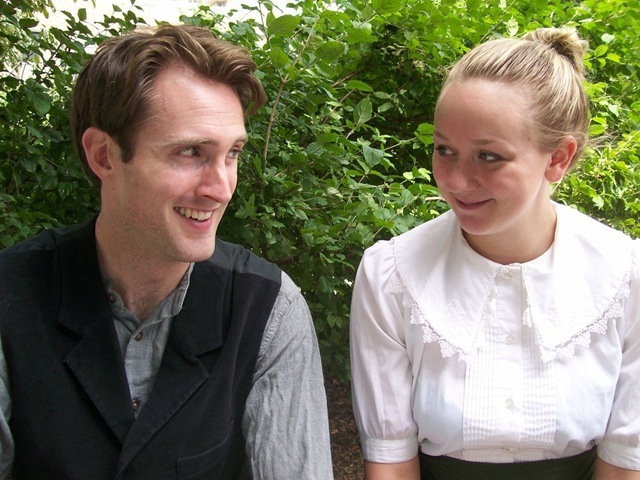 Interacting through typical conversations of homework and baseball, Engelhardt and Payne offer an innocent and sweetly awkward portrayal of two young people discovering their feelings for one another. The first act also introduces the two standout supporting roles of Professor/Constable (Kevin Lambert) and Simon Stimson (Dan Toot). Although these are smaller roles, the actors take them to heart and really make them come to life. Lambert is amusing and proves to be a strong presence while on stage. Similarly, Toot’s character, the choir organist and town drunk, is quite comical, sometimes stealing the spotlight when he’s on. Act two, “Love and Marriage,” offers a glimpse further into the relationship between Emily and George. There’s a clear chemistry between the two actors, and as the second act progresses, the characters grow and come truly to life. “Love and Marriage” runs a bit quicker than act one, which slightly drags in the beginning. It’s lovely to see George and Emily’s relationship grow; it’s evident that both Engelhardt and Payne have an understanding of their character’s psyche and the reasoning behind their actions and words. Act two concludes with their marriage and all the townsfolk gathering to wish them well. Our Town concludes with act three, “Death and Eternity.” The townsfolk have gathered in the cemetery to attend the funeral of one of their own. The tone shifts here from light and happy to stark and contemplative. 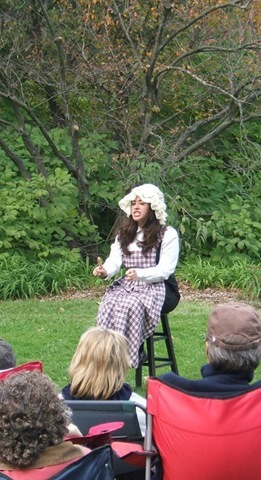 Payne’s character arch becomes even greater as she attempts to deal with the situation at hand, and real, raw emotions come through, connecting her even further to the audience. Mrs. Gibbs proves to be a comforting presence in this time of sorrow, and Nigohosian’s gentle character is a relief for both the characters and the audience members. Overall, Our Town is a solid show. The acting is generally on point, and the two-and-a-half hours go by quickly. There is quality direction by Frank Farrell, which allows each actor the confidence to move about without fumbling, and the costuming by Melissa Snyder adds another layer to the show. Each outfit is appropriate to both the characterization and the time frame of Our Town, which helps to shape the story. 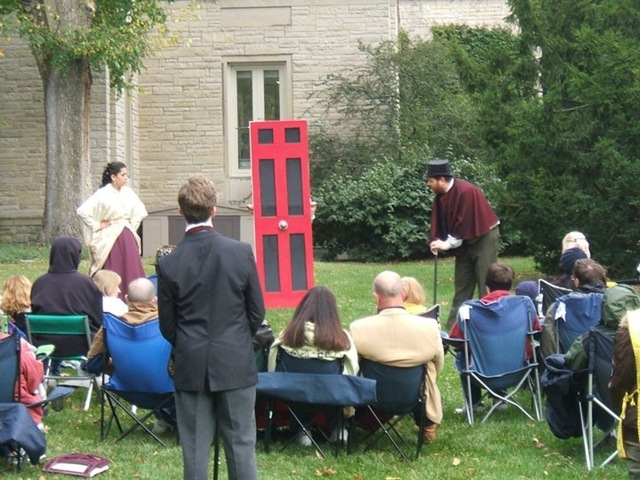 Our Town plays at the Morton Arboretum, 4100 Illinois Route 53 in Lisle, IL. The show runs on Saturdays and Sundays at 1:00 pm through September 26. Tickets are $13 to $19 and can be purchased at www.mortonarb.org or by calling (630) 725-2066. Wandering through the paths of the Morton Arboretum in Lisle, IL, a boy suddenly emerges from behind the trees, crowing and dancing around with his shadow. A proper young girl sits with her brothers as they listen to their mother’s stories. Pirates run through the grass in search of the boy who can fly. 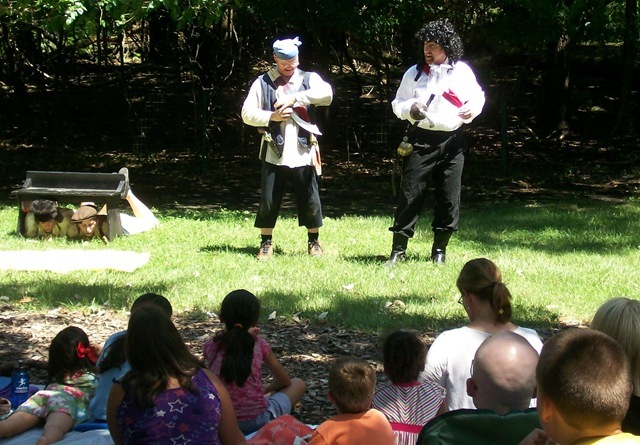 Produced by Theatre-Hikes, this outdoor production of Peter Pan or The Boy Who Wouldn’t Grow Up, the beloved children’s story by J.M. Barrie, takes the notion of Never Never Land to a new level. Peter Pan opens on the Darling family. Mr. and Mrs. Darling are getting ready for a night out while the family dog, Nana takes care of the children, Wendy, Michael and John. After the children are fast asleep, Peter Pan enters their room to retrieve his lost shadow. Waking Wendy with his crying, she sews Peter’s shadow back on for him and in return he teaches the Darling children to fly. 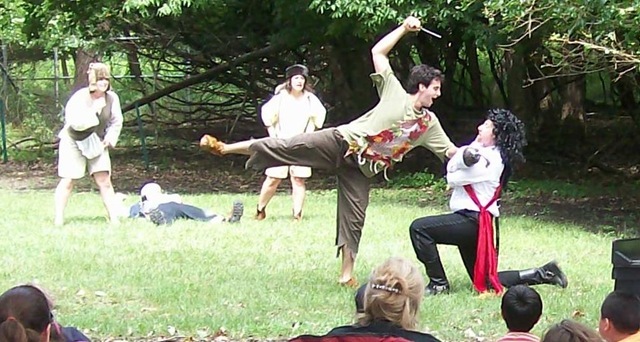 The arboretum provides a stellar background for Peter Pan. After starting in the pavilion transformed into the Darling house, the audience literally travels with Peter past the second star to the right and straight on to Never Never Land. While walking from scene to scene, the audience becomes involved in the production, creating additional atmosphere and heightening the magic that’s occurring. All the arboretum’s a stage – a stage to be used at the actors’ disposal as Peter flits and flies around, the lost boys rally and Wendy puts them all to bed under the sky. With such a huge performance space, the acting must really stand out, and for the most part it does. Peter Pan (Kaelan Strouse) is youthful, vibrant and full of energy. The moment Strouse enters, his child-like enthusiasm becomes infectious, connecting him to both his fellow actors and the audience. Although Strouse takes his acting a bit too over-the-top at times, he has a clear sense of character and knows exactly who Peter is. Back in Never Never Land, Peter introduces Wendy to the lost boys and she becomes their honorary mother. Wendy (Allison Schaffer) is adorably naïve and Schaffer’s potrayal of a little girl trying to mother unruly little boys is quality work. She could take her characterization farther at a few points, but overall she’s strong in her conflict between missing her parents and leaving Peter. Kylie Edmonds stands out as Slightly, one of the lost boys. Her performance feels genuine and it’s clear she has put in the effort to figure out her character’s back story, allowing Edmonds to step out at a higher level than the rest of the group. The cast is rounded out by Ellenkate Finley as Tootles and Anne Sears as Curly. It’s not all fun and games in Never Never Land with pirates prowling about. Captain Hook (Andrew Pond) is Peter Pan’s rival, and has made it his mission to capture and kill the boy. Pond’s portrayal of Hook is more jovial than it is menacing. And while this is children’s theatre and Hook can’t be overly scary, there’s not enough differentiation between his character as Hook and his character as Mr. Darling. (Traditionally, the same actor is cast in both roles). Because of this, Hook isn’t as believable as other characters. Pond does, however, have a way with a sword, and the fight choreography by Dwight Sora following Hook’s capture of Wendy and the lost boys is thrilling to watch. Hook’s first mate Smee (Zach Bloomfield) successfully offers well-timed comic relief. Playing both the parts of Smee and Nana, Bloomfield hilariously delivers his lines (even the ones he barked) and keeps the tone light and the audience entertained. For all that’s good about this show, the costuming by Sarah Haley lacks. The choices are understandable and suit the characters, but some garments look more like homemade Halloween costumes than costumes for a professional theatre production.